1886 George Musgrove.in Great Baddow. When George left The Cricketers Arms in Danbury the family moved to a house in Baddow Road in Great Baddow southeast of Chelmsford. While living at Great Baddow George and Emily's children attended the National School situated near St Mary's Church in the town centre. George and Emily's daughter Adelaide was born on the 29th July 1886, and the family soon then moved to Writtle on the west side of Chelmsford. When the Musgrove's had moved to Writtle, several of George's old debts caught up with him. 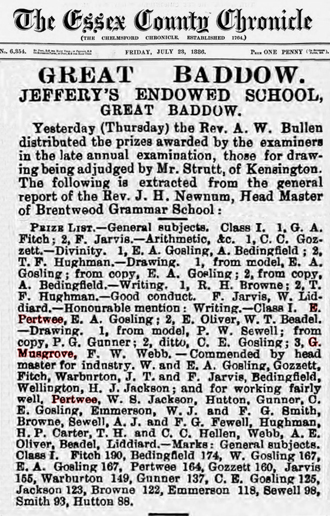 One in particular was from the schoolmaster of the National School in Great Baddow, James Macroft Turnage who took the Musgroves to the County Court for non payment of tuition fees. Above is shown the Court register for the 8th November 1886 detailing Debts of £2 - 7s plus 4s costs for tuition of defendant's children. 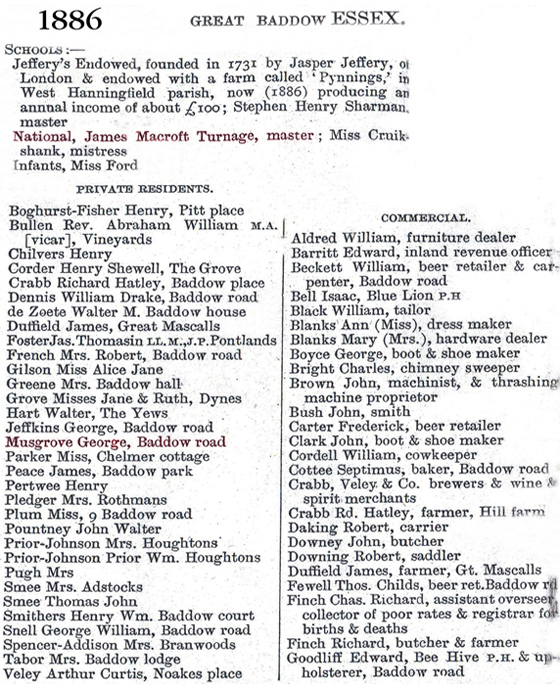 An 1886 directory (left) lists both George Musgrove and James Turnage. Note the interesting traders in the list. The school is shown below. It was built in 1877 with the left hand section being added in 1897.